In case you haven’t heard already, goldfish are beating us. Studies have shown that the average attention span has dropped from 12 seconds in 2000 to 8.25 seconds in 2015. Goldfish have a 9 second attention span, making them the slightest bit more aware than we are. Does creating an infographic take more time than writing an article? If done well, it probably should. Creating a piece that matches your company’s brand, has great visuals and engaging content is well worth the extra work, however, because it helps establish your business as an expert. Any good business resource should include data and charts, which indicates extra research and work was done on the subject matter. When placed into infographics, that information instantly turns into an easy-to-share resource, all with your company’s logo shining brightly at the top. Infographics are also great for boosting social media followers. Since they are easily shareable and able to be embedded in almost any digital channel, they are perfect tools for increasing engagement and followers. In fact, sources claim that targeted customer engagement on posts can increase by 37% when including visual elements such as infographics or photos. Would you rather read an 800-word article on the Higgs boson, or get the basic facts in an easy-to-read infographic? Unless you’re extremely interested in particle physics, you probably would prefer an infographic. Regardless of how complicated your subject matter is, it’s not a bad idea to always assume your customers have limited time to read your content. According to data gathered by MDG Advertising, 67% of consumers say clear, detailed images carry more weight than product descriptions or even customer ratings, and there are an average of 94% more total views on content that is accompanied by compelling images. When explaining a complicated product or process, it’s easy for readers to completely gloss over paragraphs of text. With an infographic, businesses have the ability to present the same information in a way that is eye-catching, colorful, and relies more on visuals than text. This creates a “snackable” piece of collateral that is easy to understand and quick to read, ultimately garnering more views, clicks, and hopefully sales. You don’t have to purchase Photoshop or be a graphic designer to create an infographic! Websites such as Canva, Infogr.am and Easel.ly are either completely free to use, or at least free during a trial period, which is just enough time to create an infographic in a pinch. If the thought of designing anything on your own terrifies you, freelance markets such as Fiverr and Upwork have plenty of options for any timeline and budget. Once your infographic has been created, it can easily be shared through various mediums. 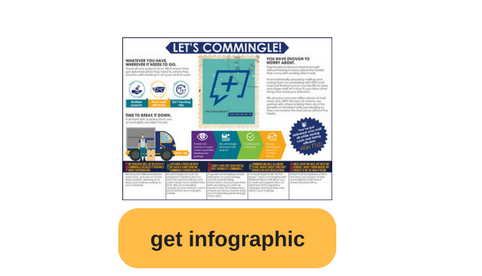 Whether you create the infographic yourself or hire someone else to do it, ensure you are receiving a high-resolution version of the file if you are planning on using the final piece in printed materials. Otherwise, share away! Infographics can be shared through social media, placed on landing pages and websites, and can even be great sales collateral. To truly increase shares, include an embed code with your infographic so others may easily paste it into their websites and blogs. 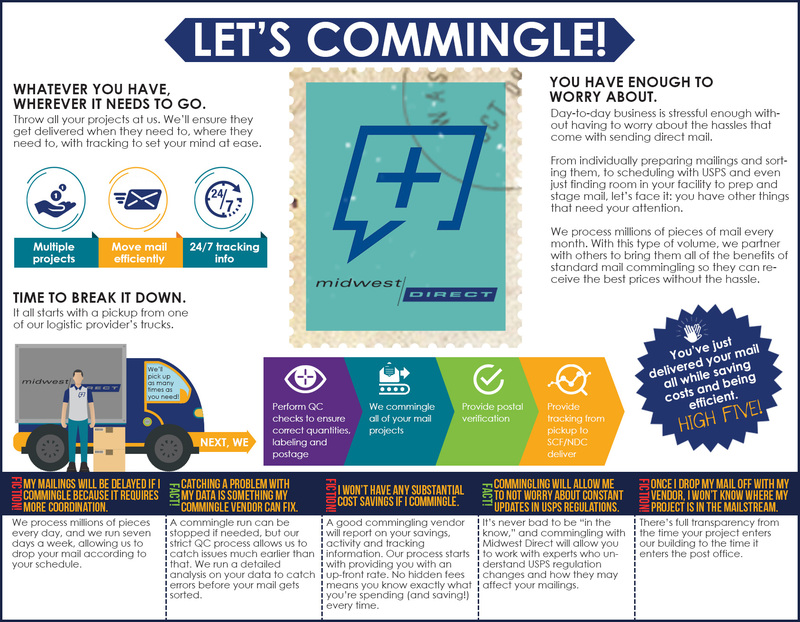 We took the often intimidating and complicated process of commingling mail and broke it down into an easy-to-understand infographic. See it here.